FiftyFlowers.com sent us the beautiful flowers for this Sunflower Wreath tutorial. 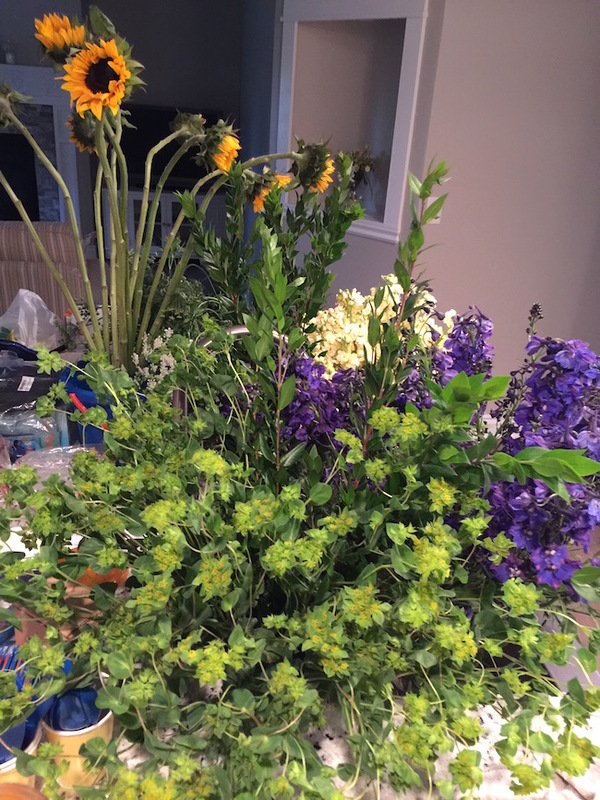 The blooms were cut and shipped directly to our doorstep from the farm where they grow and we were amazed at just how beautiful the flowers were when they arrived. You may have heard of FiftyFlowers or if you’re like me living under a rock…you haven’t. They are wholesale flowers and have every kind of flower you are looking for for your event. 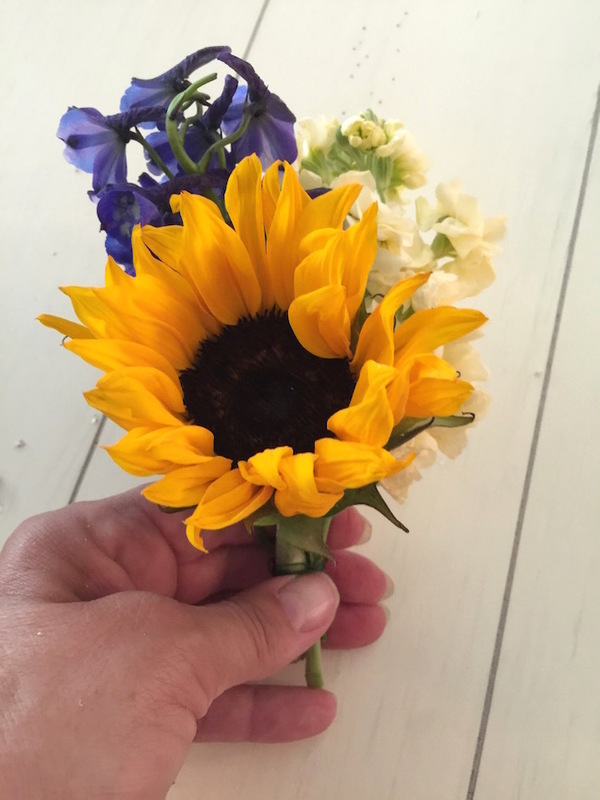 I received the Blooming Garden Spring Combo Pack that has blue, yellow and white flowers to create your centerpieces, bouquets, corsages or whatever you are making. The flower specialists will help you plan floral arrangements for your party, event, or crafts. 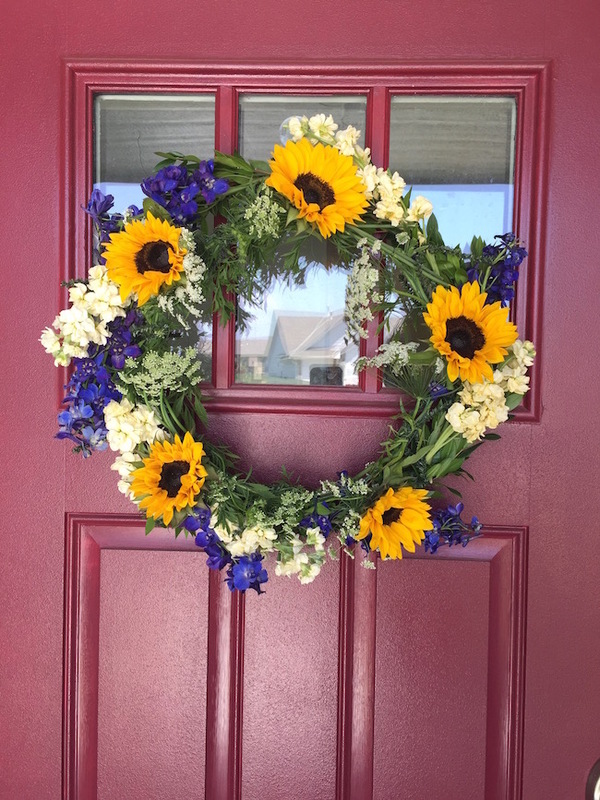 I chose to make a Sunflower Wreath which can also be used as a centerpiece. Once you order the flowers, they call you to verify your order. Then you receive another text letting you know when they will shipping. It is best to have your flowers delivered approximately 3 days before your event. They are shipped directly to you from farms around the globe. It takes about that long for them to come alive and open up. You will receive a text once they are delivered and thankfully they do because we have been in upper 90’s everyday and the delivery driver never rang the doorbell. When I received the text I went out to check and sure enough, they were sitting on my front porch. I followed the directions they sent by email on how to care for the flowers once they arrived. I cut the zip ties that were holding them in place, cut about a half inch off and placed each different flower in their own vase of water. I think I was a little stunned when they arrived because I wasn’t expecting that many gorgeous flowers. 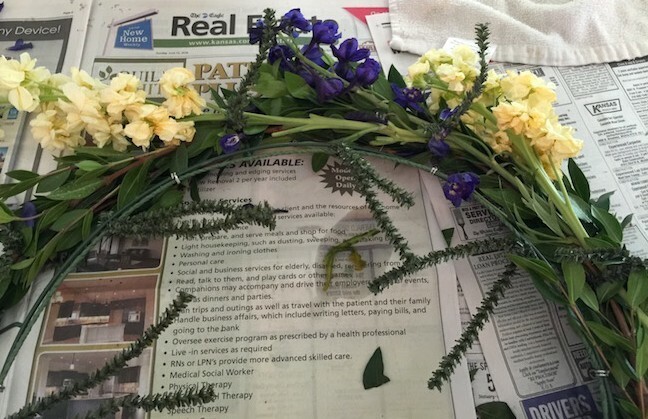 Making the Sunflower Wreath is easy. I used a wire wreath form with the pipe cleaners attached. I started with Myrtle greens and placed them on the outside ring. I continued by alternating Creamy White Stock and Blue Delphinium. 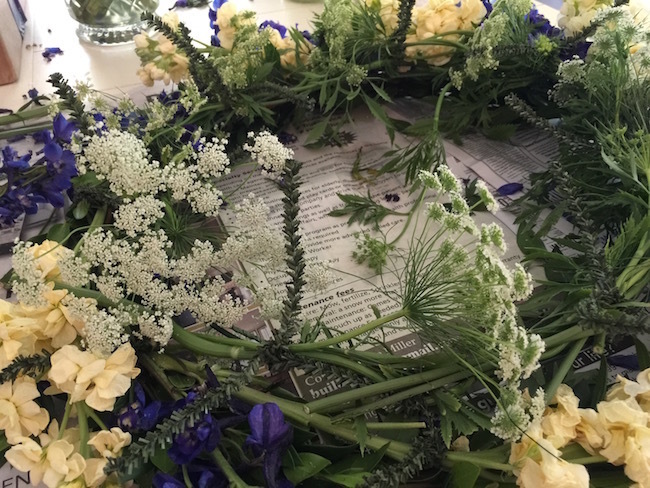 On the inside ring, I placed the Queen Anne’s Lace and the Sunflowers. If some of the flowers stick out too far, you can use some floral wire to hold them in place. I twisted a piece of wire and attached it to the back in order to hang it. You can use these to hang on the entrance to the wedding reception or use them as centerpieces on the head table or all the tables. The possibilities are endless! I also created a corsage for the groomsmen. They even have a floral design consultation service available if you need it. Contact them by phone 877-507-6737, email – events@FiftyFlowers.com, or online chat at http://www.FiftyFlowers.com/. Connect with them FiftyFlowers on Facebook, Twitter, Pinterest and Instagram. I love contrasting colors. Especially in the garden. I have put in many flowering shrubs that compliment each other. 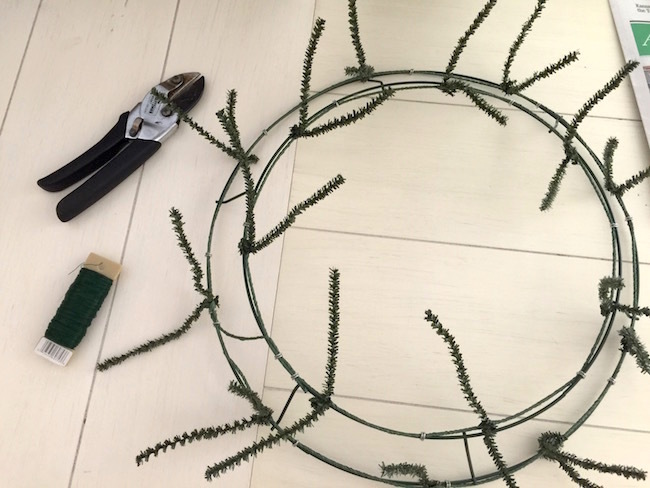 Wow, I never realized how easy it could be to make your own wreath. The wire form with the pipe cleaners built in is a handy place to start! All of the photos are beautiful, but it sure slows my computer down while they’re loading. So pretty! I’ll have to try this! I wonder how long this stays fresh. I imagine because of the flowers used, it’s quite a while. This is a beautiful color combination! I love the easy steps, too. These are gorgeous and some look so easy to do,i want to try the wreath and then some more complicated things,!? I like contrasting colors in a flower arrangement. I kept that in mind when putting my flower garden in. Beautiful arrangements. I want to try the wreath! Great colors! Although pretty, this wouldn’t be my choice for a wedding. A bit too countrified for me. And yes, I live in the south. Although it’s pretty, I wouldn’t pay for this.The flowers wilt and I’d rather buy silk. 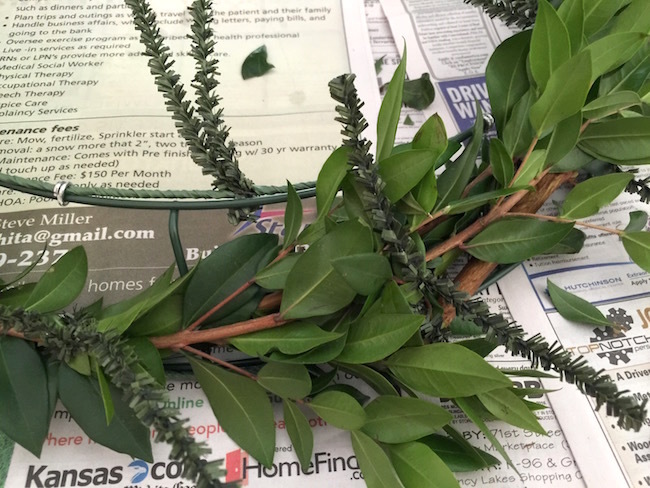 MAKING WREATHS IS ONE OF MY FAVORITE CRAFTS! I LOVE THE VARIETY AVAILABLE AND YOU CAN LET YOUR IMAGINATION RUN WILD. GOOD JOB! A corsage for the grooms man is a great idea. Beautiful & great tutorial Thank you. so pretty; thanks for the lesson! Very pretty. I wish I could make something like it. I’d use silk flowers so it would last. I like the simpleness . I’m not crafty at all. I can only imagine what mine would look like. So simple to make,thanks for the information. It’s very country looking. I really like it. We have a large southern porch and this would be ideal for the front door. Beautiful wreath. Thank you for the instructions. Absolutely gorgeous!! I love sunflowers, they’re my favorite! 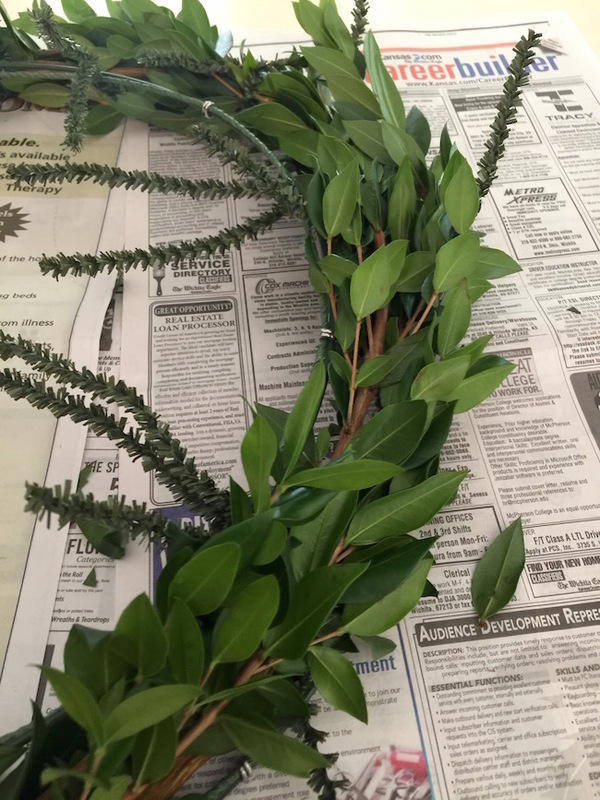 The greenery you used was really neat, people sometimes overuse ferns and I get tired of seeing them used as the fillers in bouquets and wreaths so I like that you used something different. It’s pretty but I prefer silk flowers. If they’re well made look real, and they last. That wreath looks really nice. Just gorgeous! I can’t believe you made this yourself. It looks completely professional. I love the idea of fresh flowers on a wreath! I love the colors. The wreath is really pretty. This wreath is gorgeous. 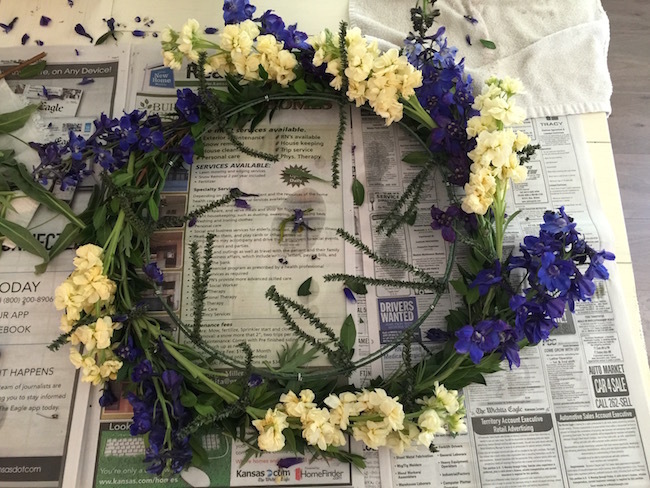 My mom and oldest sister used to make wreaths all of the time, and I remember it was pretty time consuming, but your tutorial gives me the courage to try this! I like fresh flowers. I’m not crafty at all. I love sun flowers. I love the color yellow. I love flower decor. Really pretty. I wonder how long it lasts. I imagine that it would attract bees? I love the wreath. I may attempt this project! You can make these at a very reasonable cost.When you make them yourself,you are adding your talent,imagination,and thoughts! That’s pretty. I’ve never made a wreath. I always thought it would be too hard. I have two left thumbs when it comes to crafting but this is so pretty and does not seem too hard… might give it a try….. This is so pretty I’d love to try and make it. Love the colors of the wreath.